The Karelian Folk Music Ensemble "From the Land of the Kalevala"
Gadfly Records is proud to announce the release of From the Land of the Kalevala, a new CD of instrumentals and songs from The Karelian Folk Music Ensemble. 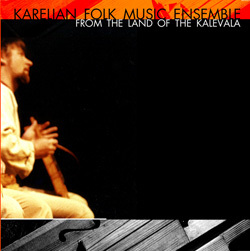 The Karelian Folk Music Ensemble (KFME) is the only touring group of musicians playing traditional folk songs and instrumentals of Karelia, a large region that is part in Russia and part in Finland. Warmly received wherever they perform, the KFME are the keepers of the flame for this distinctive ethnic music. The Karelian Folk Music Ensemble is a professionally trained and widely traveled trio of singers and musicians from Petrozavodsk, in the Republic of Karelia, Russia. The ensembles music is an exciting and interesting mix of Finnish, Russian and Karelian cultures. They sing in Finnish, Karelian and Russian, as well as perform instrumental and dance music. Igor Arkhipoff. Igor is a graduate of the Petrozavodsk Conservatory of Music. He has been a featured presenter in the Petrozavodsk State University Folk Ensemble, Toive and is now their music director. He is also the music historian and bell ringer for the island museum of Kizhi, the director of a Finnish choir, Inkeri and is on the music staff of the Petrozavodsk State University. In addition to performing in Russia, he has toured the USA, Finland, Sweden, Poland and Iraq. Alexander Bykadoroff. Sasha is a graduate of the Petrozavodsk Conservatory in Choral Conducting. He has been a choir director, and an orchestra conductor of the Karelian national folk ensemble, Kantele. As a child, he performed piano in competitions as a child prodigy and since then has added many other instruments. He is a composer and music arranger and is currently the musical director of a folk group Myllarit. With Myllarit, he has toured Russia, Finland, Norway, Sweden, the USA, Canada, Scotland and Germany. Arto Rinne. Arto is a graduate of Petrozavodsk State University and was also a member of the Folk Ensemble Toive. He started his musical career as a singer in a boys choir when he was six. He sings and plays many instruments. Currently he performs with the folk group Myllarit and with them, has toured Russia, Finland, Sweden, Canada, Norway, the USA, Scotland and Germany. Th. 2/8/01 Wenatchee, WA W. Coast Convention Ctr. Sun.2/18/01 Vancouver, BC Scandinavian Comm. Ctr.